I'm over at 5 Miuntes for Books again, this time talking about a new author/illustrator that I have recently discovered and LOVE! Not only that, but my son loves him too. So this is a great thing, yes? Butler is a great children's author and illustrator. Butler's website is also intriguing and has a few games for children to play that are based on his book. I received these books as review copies but I loved them so much that I went out and purchased more for ourselves. 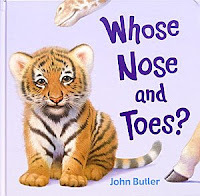 Yesterday we bought "Whose Nose and Toes?" and I read it three times at my son's encouragement ("ah-gain?! gain!?) before I suggested we might want to try a different book. I love John Butler. Really, I do! I think you would too. Have a kid in your life that likes to read? You absolutely cannot go wrong with these.